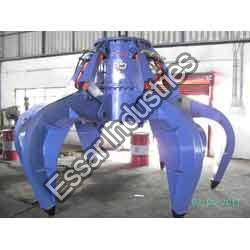 Electro Hydraulic Grabs consist of 5/6 Tines which are designed for handling heavy shredded scrap of density up to 3 T/Cu.M. The main body of the grab which is cylindrical shape and the tines are orange peel shape are rigid steel fabricated construction. The tines are attached to the main body of the Grab by suitable steel pins and spherical bearings to take care of all longitudinal as well as axial loads. The main cylindrical body contains an integral hydraulic power pack unit which actuates 5/6 Nos. Hydraulic Cylinders which are suitably hinged to the main body at one end each tines at the other end. Looking for Multi Jaw Grab ?